Photography at Jordan Pines is something that you will not regret. Located just 10 miles up Big Cottonwood Canyon, Jordan Pines has such beauty that there is sure to be a look that you love. Whether you are looking for large, beautiful pine trees or an open valley with mountains in the background, you will find it at Jordan Pines. Fall comes early at Jordan Pines, being that it is at a higher elevation. If you want some fall color, opt for pictures either in late September or the early December to capture that color before its gone. But honestly, this location is stunning any time of the year. During the winter, photography at Jordan Pines is still beautiful, delivering pictures with snow-covered pines and mountain peaks. Be aware that boots will most likely be necessary during the winter months so that we can trudge a bit off the beaten path. Easy to find and plenty of parking makes this spot perfect for your next photo session. Whether you are planning bridal photography with just the bride, or with both the bride and groom, family photography, senior photography or even photography of your children, photography at Jordan Pines is a perfect location. Dogs are not allowed at Jordan Pines, as this is a watershed area. Please leave them at home. Also, for shoots in the evening, bug spray and a light jacket may be necessary, so plan accordingly. Also keep in mind that there is a $30 travel fee to shoot here, but don’t let that dissuade you. The photography at Jordan Pines will be well worth it! Travel on Big Cottonwood Canyon Road for about 9 miles up the canyon to Cardiff Fork (Mill D South Fork). Do not drive all the way to the campground, they will charge you to enter. 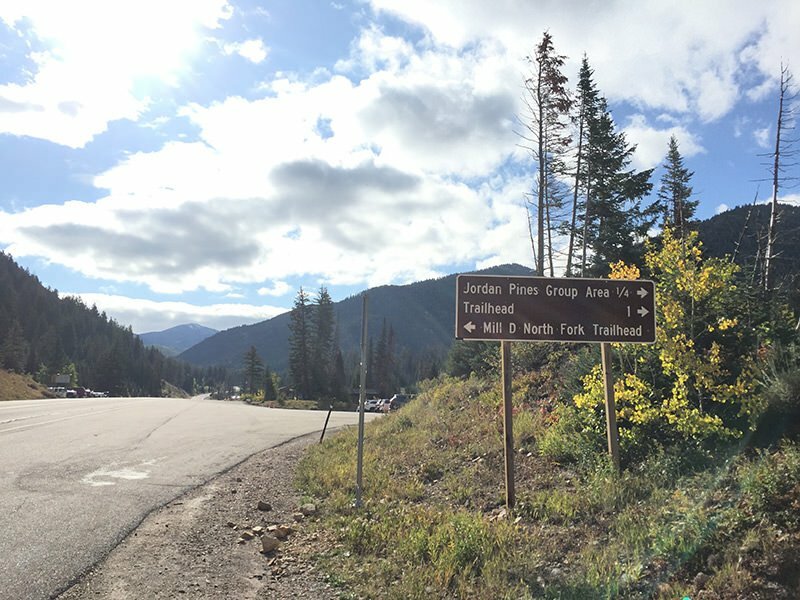 There is a parking area right off Big Cottonwood Canyon road at the Donut Falls trailhead. We will meet there. As you head up, you will see the sign below. Park on the right side of the road. Take a look at some highlight images from photography at Jordan Pines by scrolling through the variety of images below. To see an entire photography session from Jordan Pines located ten miles up Big Cottonwood Canyon, click on an image below. This location has something for everyone and such great variety as well. Select an image below and a new window will open to show the images from that session.